Xbox One alpha build 1711 (16299.4016 rs3_release_xbox_dev_1711.171024-1923) now rolling out for Insider members. The Microsoft Store now enables gifting of select digital Xbox One games. In addition to games and friends, you will soon be able to add club blocks to Home. Check out the big changelog below. • For Xbox Insiders in the Alpha ring, the Microsoft Store now enables gifting of select digital Xbox One games, “durable” downloadable content (DLC) (map packs, weapon skins, etc. ), Xbox Live Gold, and Xbox Game Pass—right from your console! 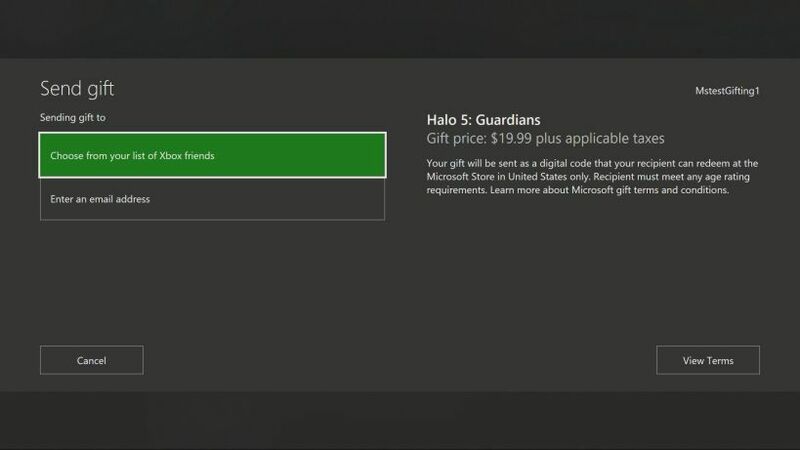 Just choose a game within the Store, select “Buy as Gift,” and send it to your friends or family members by picking their Gamertag or entering their email address. • The Xbox app for iOS and Android will now enable you to finish setting up your new Xbox One X console while it’s downloading the day one update. Additionally, we’ve also improved the process for enabling 4K output right out of the box. • Xbox’s new notifications provide an at-a-glance status of what activities you can immediately step into after you’ve had to step out for a moment. We’re adding additional notifications types when your system goes idle, including LFG posts, broadcasts, and Achievements. • Adding miniature Game Hubs for your most recently used games in the Guide. That way, you can access the great content on a game hub without having to leave the action. • Games with no unlocked achievements can now be hidden from the personal and public view of your profile. You’ll soon be able to send digital games and subscriptions as gifts to your friends and family in the Microsoft Store (on Xbox, Windows and on the Web), and today (10/27) at 1:00PM PDT we’re allowing Preview Alpha participants a first look! When purchasing a gift, the gift will be delivered to the recipient via email message containing a digital code for the item. The email will be sent immediately upon purchase. The email message will provide the gift recipient with instructions on how to redeem the digital code. Resolved an issue which sometimes prevented content blocks from being added to Home. Fixed an issue which sometimes caused party chat to unexpectedly disconnect. Miscellaneous improvements for party chat stability. Resolved an issue which could cause the console to get stuck displaying video content in 24hz after playing a Blu-Ray. Resolved an issue which caused 3D Blu-Rays to play in 2D. Fixed an issue which caused Dolby Atmos settings to reset after resuming from connected standby. Note that not all planned features for this update are available at this time. If you’re on the Xbox Preview Alpha ring, you can check for the latest Xbox One Insider build 16299.4016 (rs3_release_xbox_dev_1711.171024-1923) by going to Settings -> System -> Updates.